1. Avoid staining foods – Some of your favorite foods can, unfortunately, cause stains on your teeth. Even beverages like red wine, soda and coffee can dull the whiteness of teeth, leaving a not-so-bright smile. Try to brush soon after eating darker foods to preserve your smile’s natural brightness. 2. Don’t smoke – Not only is it bad for your general health, but for your dental health. Those that smoke tend to have stains on their teeth. Also smoking can prolong and lessen complete healing after dental treatment. 3. Remember to smile – Kids seem to smile all the time, but grown-ups tend to forget to smile. Smiling shows that we are engaged with a happy with life and enjoying ourselves — all signs of youth. 4. Good oral care – Of course, taking care of your smile involves good oral care. Be sure to brush and floss at least twice daily, and change your toothbrush frequently. By brushing and flossing, you will be reducing gum problems, such as receding gums, which can change the way your smile looks. 5. We highly recommend regular oral exams and preventative cleaning appointments to insure your smile is as bright as possible. Also ask us about procedures to brighten your smile such as bleaching or veneers. Let your smile be your greatest accessory! We are a general and cosmetic dental practice dedicated to improving your smile and the overall oral health of you and your family. 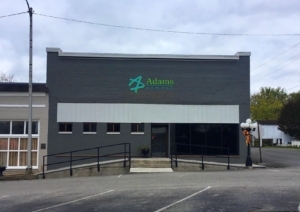 Adams Dental - Dentist in Alexandria, TN - All Rights Reserved.